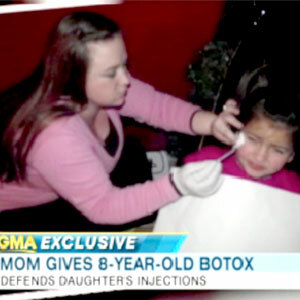 A few weeks ago, a story of a Mother who injected her 8 year old daughter with Botox made international news. The woman and her daughter appeared on national television to share their story. The story turned out to be a hoax. The woman even used a phony name. The Sun strongly denies any suggestion it solicited or knowingly published a false story regarding Kerry Campbell and her daughter. The article was published in good faith, in common with a large number of other news organisations around the world, after being received in full from a reputable UK news agency. The Agency reporter watched Ms Campbell administering what appeared to be Botox to her daughter and provided compelling photographs. At no point did The Sun have any direct contact with Kerry Campbell or Sheena Upton. The Sun is investigating the circumstances surrounding this story and consulting with lawyers on possible legal action. I found it humorous when I read that the media actually fell for this fake story. I am sure that some folks will agree that the media needs to check their sources more carefully. I’ve been writing a lot about how the media bombards us with sensationalism. This is what they believe the American public wants!! This past week, the joke was on them.